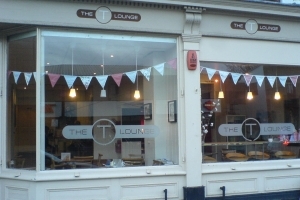 On one side of their flyer they call themselves The Tea Lounge, on the other it's The T Lounge. I'm going to go for The Tea Lounge on the basis that a single letter T should only be used by a man who pities the fool... So, The Tea Lounge it is. And what a great place it is to find great tea! The range of teas is satisfyingly large - traditional, decaff, fruit teas, green tea, rooibos, Earl Grey, lapsang souchong, darjeeling - and you can order it in pots for one, two or three drinkers. An always-nice touch is that the tea pots come with little infusers suspended beneath their lids - no ratty old tea bags in sight! For the unenlightened who don't want tea (what's wrong with you? ), The Tea Lounge offers Spanish hot chocolate too, which I'm told is very nice, plus a variety of coffees. Stick with the tea though! There's a comprehensive food offering too. As well as paninis and cakes (oh so many cakes! ), breakfasts and light lunches are also served, whilst proper afternoon tea - the whole "plate of sandwiches, plate of cakes and pot of tea" package - can be served by arrangement. What I'm trying to say is that it's a good place to go for great food as well as great tea. Brick Lane bagels are also offered too - apparently this is a good thing, so I thought I'd mention it. Beyond the menu and the friendly service, The Tea Lounge is full of excellent little touches that make it a great place to just spend time. There are works of art by local artists on the wall, some of which are for sale. There are quality newspapers to read. There are (a few) secondhand books for sale. There are toys for kids to play with. There are proper china tea sets on display in cabinets, and some of these are for sale too. And not that they like to blow their own collective trumpet, but they make the best cheese scones in the world too. Add to all this the facts that they have a cake delivery service (subliminal recommendation: lemon drizzle, lemon drizzle ,lemon drizzle), offer Mad Hatter's tea parties for kids and provide a LGBT Valentine's night and you start to see that this is an unusual place... and lest we forget, unusual is a good thing. So there we are, The Tea Lounge: so good, it's great!